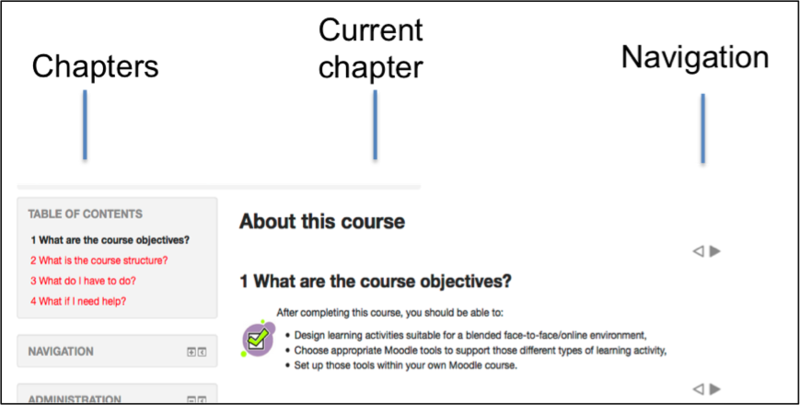 A Moodle book is a multi-page resource, organised as chapters and subchapters, which can contain embedded images, videos, webpages etc., as well as text, and is useful for displaying lengthy information which can be structured in separate sections. It is another means of decluttering the Moodle course home page. Students can print the whole book or sections of it. Below is an example of a simple book with four chapters. 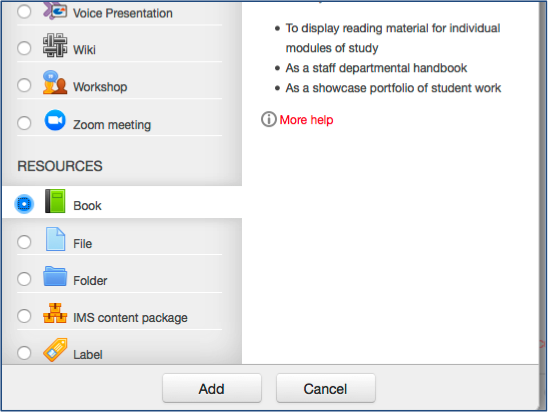 Click Add an activity or resource, scroll down to RESOURCES, select Book and click Add. Give the book a meaningful name and optionally a description. 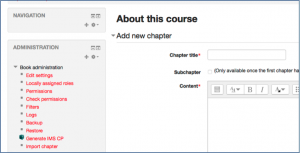 Under Appearance, choose how you want the chapters and sub-chapters of the book to be displayed in the TABLE OF CONTENTS. The default Numbers is often fine, unless the titles contain their own numbering. None – Titles only, useful if you want to define your own numbering. Numbers – formatted as 1, 1.1, 1.2, 2, 2.1, 2.2, etc. Bullets – Titles and sub-chapters appear with bullets and indented. Indented – Sub-chapters appear indented. 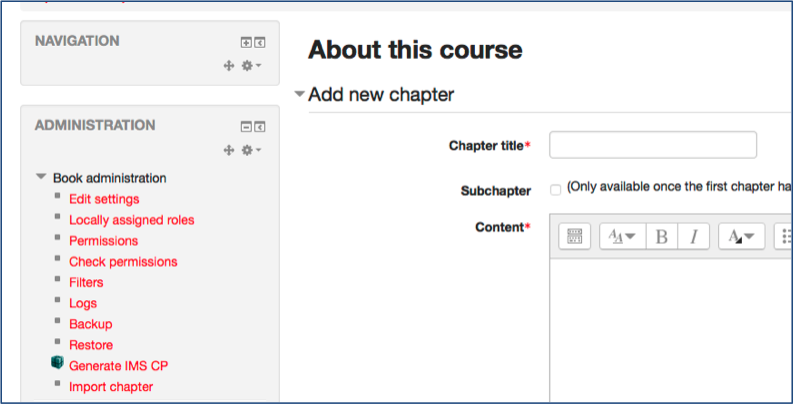 Use Custom titles if you want a title other than the chapter title that appears in the Table of Contents to be entered as part of the content. For example, you might use ‘Lecture One’ as Chapter title but want ‘Chapter One Introduction to Economics’ to appear above the content itself. Make sure Turn Editing on still applies and click the book you have just created to add your first chapter. Note the Book administration options in the ADMINISTRATION block on the left. As well as being able to type in or paste content, it is also possible to import it as HTML pages. See Importing chapters on Moodle Docs for more information. Give the chapter a title and add the content to Content. 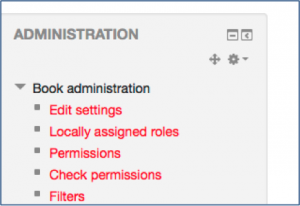 The chapters and subchapters of a book are created in the same way as pages – see Use the default Text editor. If copying from a Word document remember to use the Clear formatting icon to remove formatting that would interfere with the Moodle stylesheet. Save Changes to add the chapter. The TABLE OF CONTENTS now has one entry. To add another chapter, click the + icon alongside the chapter title that you have just added. Add the new chapter and repeat as necessary. To add a subchapter, click + under the relevant chapter and select Subchapter as you create the content. To make any changes to the book name or appearance, e.g. whether you use numbering or not, use Edit Settings in Book Administration in the ADMINISTRATION block.